The Datalogic DataVS1 vision sensor series is the easiest solution for machine vision applications. 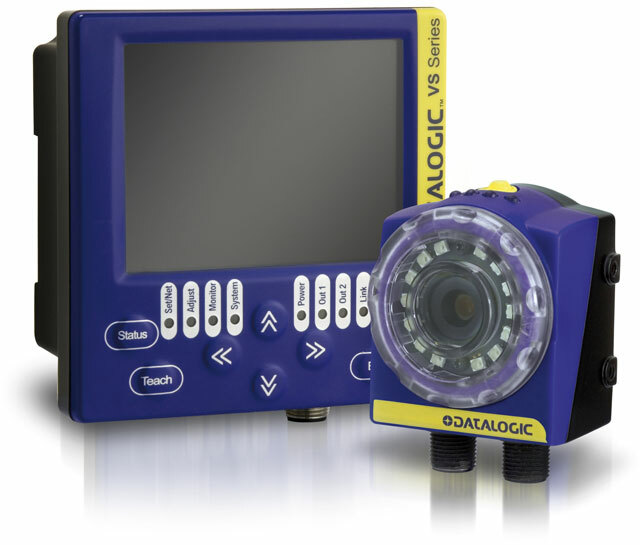 The setup does not require a PC and it is very quick and intuitive thanks to the VSC unit, the external configurator with 3.5" color display. The sensor setting is carried-out through three simple steps: region of interest definition, control type selection, parameter adjusting. DataVS1 is able to carry-out many different kinds of control such as presence/absence verification, position, object counting and OCV. -16-Dc-S Vision Sensor, 16 Mm Lens, Configurator Connection. Priced per unit. 4 week lead time. -12-Dc-S Vision Sensor, 12 Mm Lens, Configurator Connection. Priced per unit. 4 week lead time. -08-Dc-S Vision Sensor, 8 Mm Lens, Configurator Connection. Priced per unit. 4 week lead time. -06-Dc-S Vision Sensor, 6 Mm Lens, Configurator Connection. Priced per unit. 4 week lead time. -08-Dc-K Vision Sensor 8 Mm Lens Vscconfigurator DataVs-Vsc Conn.C. Priced per unit. 4 week lead time. DataVs-Cv-Vsm-04 Connection Cable 4Mt. Priced per unit. 5 week lead time. DataVs-Cv-Vsm-02 Connection Cable 2Mt. Priced per unit. 1 week lead time. DataVs1 Updating Kit DataVs1 Updating Kit. Priced per unit. 5 week lead time. DataVs2-Vsm Vsm Monitor For DataVs2. Priced per unit. 1 week lead time. DataVs-Mk-01 Mounting Kit. Priced per unit. 1 week lead time.